A UIBE delegation led by Vice President Zhao Zhongxiu visited Belgium, Switzerland and Germany in June, 2017. 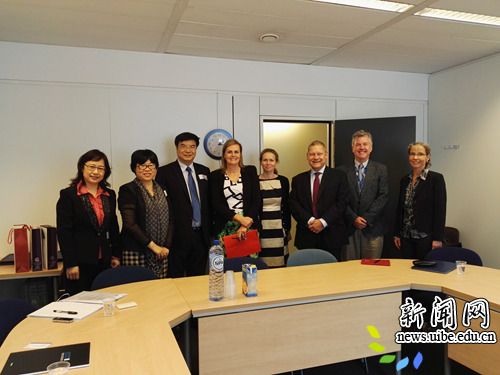 The delegation visited the Mission of the People's Republic of China to the European Union, and the EU's Directorate-General for Interpretation (SCIC) for discussion on how to jointly cultivate senior interpreters. The delegation then paid visits to the WTO, the International Centre for Trade and Sustainable Development (ICTSD), and met the Permanent Mission of the People's Republic of China to the WTO to discuss how to send UIBE students to international organizations for internship and other cooperation issues. A UIBE delegation led by Vice President Zhao Zhongxiu holds talks with UIBE students studying the Martin-Luther University Halle-Wittenberg in Germany.